"Hong Kong style karaoke in Soho"
Karaoke bars aren’t as popular in London as they might be but Karaoke Box has a distinct Hong Kong vibe to it that gets it right. Private rooms for a range of group sizes, service while you sing and even a small menu of pizzas and sandwiches should your wailing make you hungry. 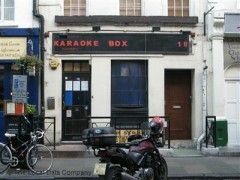 Located on Frith Street (although there are branches in Mayfair and Smithfield), Karaoke Box is well positioned in the heart of Soho. When the pubs shut, meals finish or theatre is over, the modern karaoke bar is waiting to sweep you in. Rooms are available for five, seven, nine or twelve people and the prices rise accordingly. Unsurprisingly – given the time that people tend to decide that karaoke has to happen – the cost goes up between 9pm and 2.30am. Rooms start at £35 per hour for groups of five and go up to £84 per hour for groups of twelve. The rooms are comfortable and practical and the sound quality is acceptable but on this occasion the mics were temperamental at times - nothing is more annoying than cutting out halfway through the chorus when you’re doing the Outhere Brothers’ smash, Boom Boom Boom. However, given the rates at Karaoke Box compared to the likes of Lucky Voice, a little temporary mic trouble is well worth the savings you make. Drinks still come to the room, the service is friendly and accommodating and the list of songs available is impressive.